Asian eggplants are usually long and thin, and come in a variety of colors. With fewer seeds than Western eggplant varieties, they are often less bitter and have a mild, sweet flavor and meatier texture. Bitter melon is a tropical fruit-like gourd that is around the same size as a cucumber with rough, edible skin and a translucent white fruit. As the name suggests, the Bitter Melon is considered the most bitter fruit. The smaller sized fruit are the least bitter, and scooping out the seeds also helps with this. Some cooks like to salt the fruit before cooking to reduce the bitterness. With high iron, beta-carotene and calcium, the Bitter Melon is also known for its array of health benefits. It is usually paired with meats in a stir fry, or can be cooked down in a stew or curry. A staple of Asian cuisine, Bok Choy has a mild, sweet cabbage-y flavor and a soft crunch. It is a variety of Chinese cabbage, but instead of growing a head, it grows blades or tender leaves. The stem is edible and has a nice juicy crunch. It is great thrown in the pan first and sautéed with garlic, then the green parts of the leaves can be added later for a quick sauté. Bok Choy has a gentle bitterness that stands up to strong, rich flavors. Bottle Gourds are a vine crop grown for its fruit, which can be harvested young as a vegetable or allowed to mature, dry and be used as a utensil or musical instrument. As a vegetable, bottle gourd is used in stir-fries or soups, dried and marinated in strips for sushi, or cooked as a summer squash. In some areas, the seeds are toasted, ground and mixed with other ingredients to make a drink. The shoots, tendrils and leaves can also be eaten as greens. There are many varieties of bush beans, which basically is any snap bean that has a low growing, small bush growth habit. These beans can be green, purple,yellow, or speckled and can be small round pods or larger flat pods. 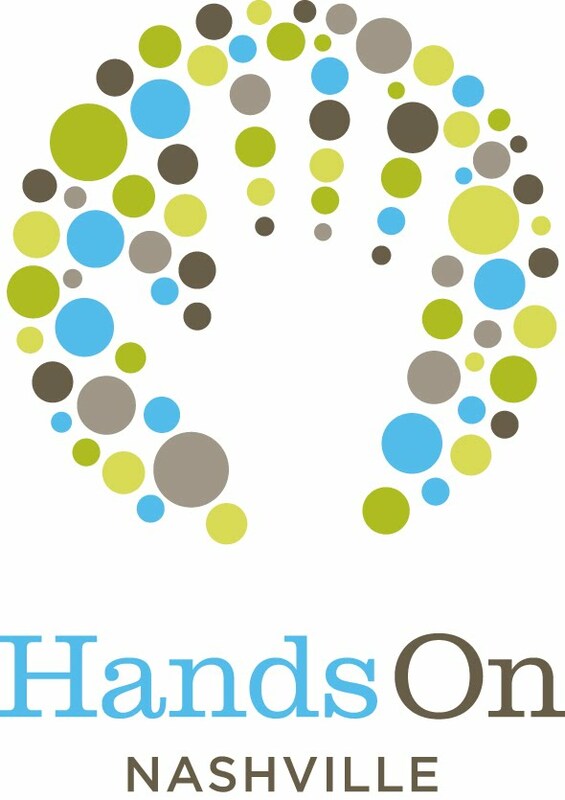 There are both stringed and stringless varieties. Similar to watercress, chamsur has a spicy scent and a slightly bitter, peppery, and tangy flavor when fresh. When cooked, the peppery flavor subdues slightly. One Growing Together farmer recommends this herb for pregnant women due to its medicinal properties. The Daikon Radish is a root vegetable, but instead of having a potent, peppery taste, it's sweet, crisp and mild. The mild radish contains a high concentration of enzymes that help with digestion of fats and starches. Daikon radishes can be used in salads, pickled or even stir-fried. Fresh, immature pods are crisp and have four to six plump white seeds with pink and purple stripes. The fresh seeds are firm, slightly starchy, nutty, and sweet. The entire bean can be eaten raw or cooked at this youthful stage. Hakurei turnips are a small, delicately flavored Japanese variety of turnip that will please picky eaters! Sweet enough to be eaten raw, they are great used to liven up salads. They can also be stir-fried or roasted - and if they still have their tender greens attached don’t forget to use those as well! They will quickly cook if added in the last minutes of cooking. Hot peppers have a kick to them! Growing Together sells many varieties with varying degrees of heat. Also known as Lablab, Hyacinth is known for its flower and quickly growing vine both as an ornamental plant as well as for the bean, which is eaten widely around the world. 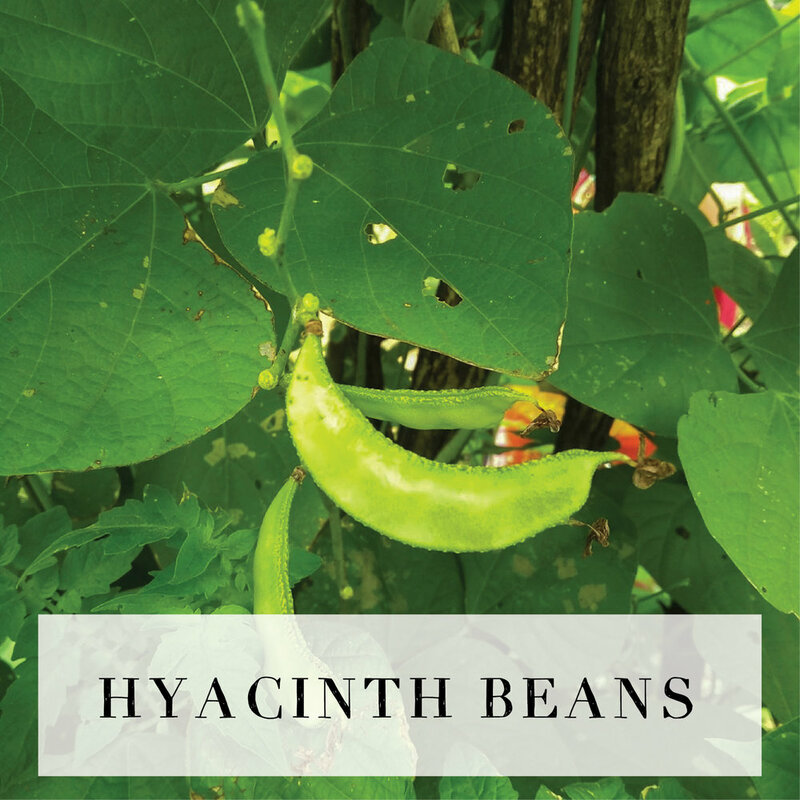 Young hyacinth beans are great raw or cooked in stir fries or curries. When young, komatsuna is tender and delicate with a mild mustard bite but is sweet enough to be eaten raw in salads. Larger leaves are fibrous and hardy with an assertive crunch and a peppery mustard finish and are best cooked like other mild greens. A relative of the cucumber, luffa gourds are well known for their modern-day, synthetic counterpart, the luffa sponge. However, these prolific plants produce gourds that, when harvested young, are very tasty! Most often, luffa is eaten in curries and stir fries and cooked similarly to summer squash. The gourds should be left on the vine for as long as possible if growing them for their sponge qualities, and once they have dried out, they can be peeled, de-seeded, and dried for use in the bath! 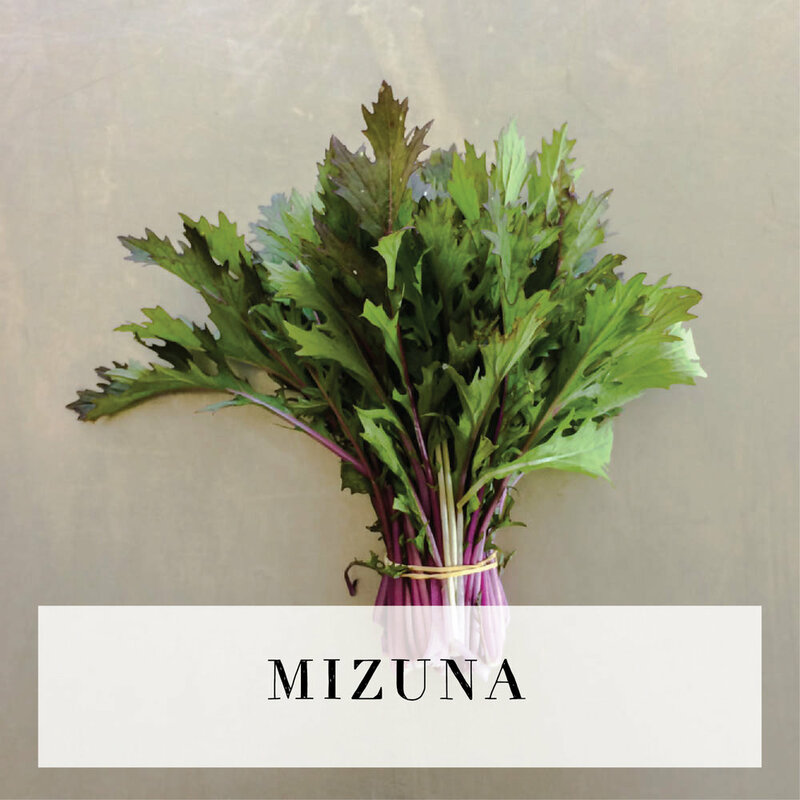 Mizuna has a bright, piquant mustard flavor with a subtle earthiness. It shines when eaten fresh in salads. Cut from the vining ends of pumpkin plants, most Growing Together farmers recommend peeling off the fuzzy outer layer and frying them alongside tomatoes. Yum! Roselle calyx is the dried flowers of what is known as the hibiscus plant. It offers a sweet and refreshing floral taste. When it is brewed into a tea, Roselle can have a slightly tart or sour flavor. Although many communities seek the hibiscus flower, Burmese and Bhutanese growers love the green leaves of the Roselle plant, which have a lemony sourness. Shishito Peppers have a peppery flavor with sweet, grassy nuances. Its heat can vary from very mild to spicy hot with one in ten peppers offering a heat on average ranging from 100 to 1000 on the Scoville scale. Cooks love to fry them whole in oil until blistered and slightly blackened, and then sprinkle them with a flaky salt! Snake gourd is a vining plant that grows long snake-like fruit that hangs down from it's climbing stems. Some snake gourds can grow to be many feet long if left unharvested! The fleshy part of the gourd has a mild flavor and is often cooked similarly to tomatoes in many Asian cuisines. Suehlihung Mustard is a versatile mustard with serrated leaves. It is similar to Mizuna, with the standard peppery mustard taste and earthy nuances. Rainbow Swiss Chard has subtle earthy flavors and a mild salty characteristic. It is strongly flavored and stands up well to Italian flavors and hearty pasta dishes. Chard is known to be a nutritional powerhouse vegetable packed with vitamins, nutrients and health benefits. It contains high levels of vitamins C, K, E, beta-carotene and the minerals manganese and zinc. Its beautiful colored stems, ranging from gold, pink, orange, purple, red, and white, will brighten up any recipe! Raw tatsoi displays sweet yet nutty flavors and a mineral finish. It is very versatile and can be used as a substitute for both salad greens or any quick cooking Asian green. Once cooked, it develops a warm earthiness similar to spinach. It has short pale lime green stems that are tender, similar to the celery heart. The stems can be eaten raw or cooked. 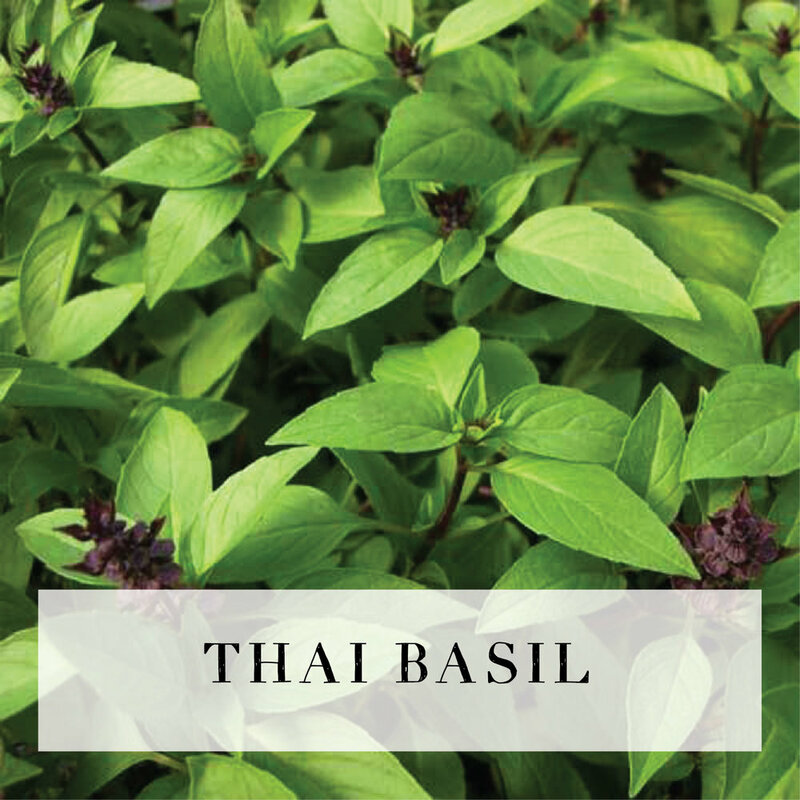 Thai Basil has flavors reminiscent of anise and licorice but is slightly spicy. It is more stable under high or extended cooking temperatures than that of sweet basil. Tokyo Bekana cabbage is a chinese cabbage variety with mild pepper nuances. It is pale green and fluffy, with a hearty texture. It is a great substitute for lettuces if shredded in a salad. Great raw or lightly cooked! It takes the heat well so sometimes can be found in summer when few other greens are available. 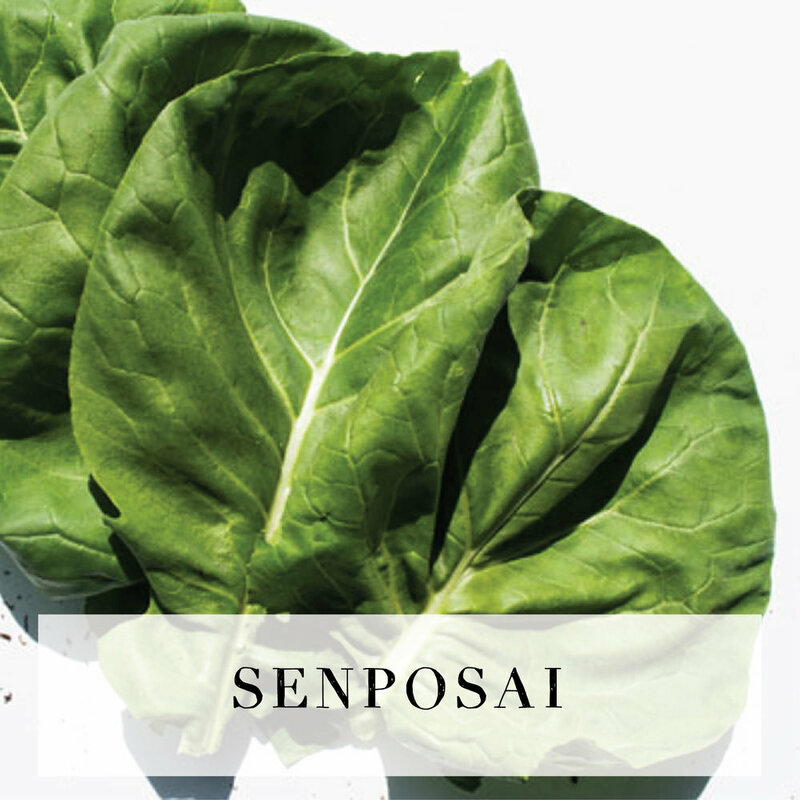 Senposai is a hybrid of cabbage and komatsuna. This unique vegetable has the sweet taste of cabbage and the tenderness of komatsuna. It also grows well in the summer. Water spinach has a similar flavor and texture to common spinach, with mild, nutty undertones. Its young shoots and leaves are preferred to mature leaves as they are more tender and sweeter in taste. It is commonly cooked in Asian food and the Burmese growers love it! It has hollow stems which take a bit longer to cook. When cooked, the leaves have a silky texture that pairs well in any stir fry. The cooked leaves can be a bit fibrous, so it is good to chop them. The Yard-long Bean is a relative of the cowpea. Slightly chewy but still crisp, these beans have a slightly sweet, green bean flavor but with a bit stronger taste. They are good raw if chopped into small pieces for a salad, but their natural sweetness and deep flavor really shines when cooked!